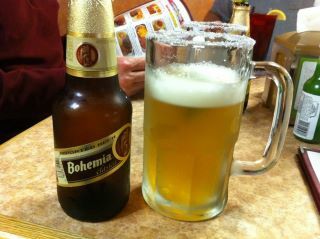 Bohemia Clasica tonight. It's a decent Mexican beer, not the best, but not the worst. Very mild flavor, lightly hopped. Pours a clear golden color with white head. Provides a crisp, clean flavor and smell with little to no linger. Oddly the restaurant served it in a salted glass with a massive lime wedge (almost half a lime).